While my boss is in London this week, another buddy of mine is out and about near Philly. It brought back some great memories of walks back and forth to work at the Fed Reserve, when I worked a project there for about six months. This walk was not so great. It was raining and windy, and I was soaked, but I did stop and snap a quick photo that somehow turned out brilliant. 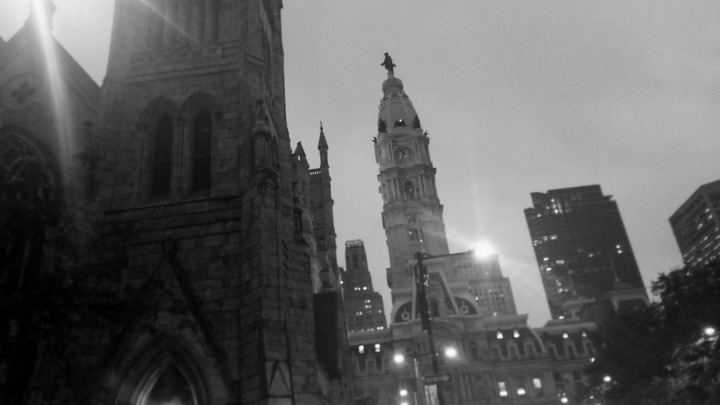 The photo was shot off Arch St near the heart of downtown Philly. The Gothic stye building in the foreground is Arch St United Methodist Church, one of Philadelphia’s many architectural treasures, which was built in 1860s. And in the background is the magnificent Philadelphia City Hall, which is the largest municipal building in the United States, completed in 1901.